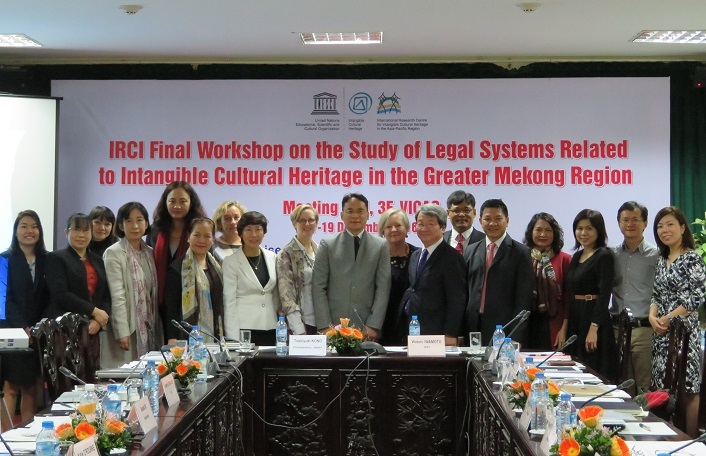 “Study of Legal Systems related to Intangible Cultural Heritage in the Greater Mekong Region” started in 2013. The project aims to analyse the legal systems to safeguard intangible cultural heritage (ICH) including laws and regulations, policies and good practices in the countries, and to identify possible solutions, whereby developing a “tool kit for planning legal mechanisms” that will help the member states to develop the effective legal systems in order to safeguard their ICH by examining each country’s situation. In the past years, workshops were held at Kyushu University in Fukuoka, Japan in December 2014, and in Toyama City, Japan in December 2015, while sending a team of experts for the field survey in the countries such as Viet Nam, Cambodia, Myanmar, Thailand, and Laos. The final workshop was held from 17 to 19 December 2016 in collaboration with Professor Toshiyuki Kono (Faculty of Law, Kyushu University) at the Vietnam National Institute of Culture and Arts Studies (VICAS), Ha Noi, Viet Nam. A total of 19 experts from 7 countries of the Asia-Pacific region and 1 from another region attended this workshop, including observers from the UNESCO Ha Noi Office, Ministry of Culture, Sports and Tourism (MOCST), Viet Nam, and Princess Maha Chakri Sirindhorn Anthropology Centre (SAC), Thailand. The workshop concluded with an outcome of recommendations with a draft “tool kit for planning legal mechanisms”. These outcomes will be edited in the coming few months and be published by IRCI in the near future not only in English but also in 5 other languages such as Vietnamese, Khmer, Myanmar language, Thai, and Lao. Contact Misako Ohnuki (IRCI) for further inquiries.